When I was six, a guide by the name of John at Birchdale (a hunting and fishing lodge in Southwest Nova Scotia) taught me how to paddle. There were two guides there around that time: John Jeffrey (deceased) and John Prout. I had the good pleasure of meeting John Prout just over a year ago. 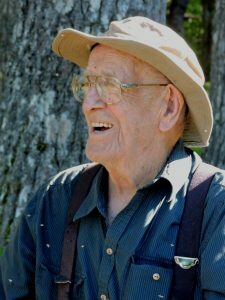 He was approaching his 91st birthday and he agreed to go back to Birchdale with Barrie and me and paddle up to the Barrio–which we did last June. 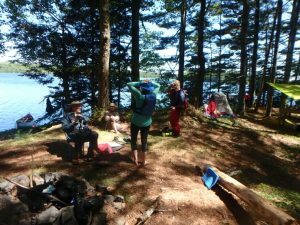 We spent two nights at Birchdale then on Day 3 when the weather cleared, we paddled up to “the Barrio” which involved paddling through three small lakes and three stillwaters then across the Barrio Lake to the campsite where friends had spent the night. The first photo is John paddling stern, with my husband Barrie in the bow, on their way to the Barrio. The second photo is John sitting at the campsite telling stories and the third photo is AFTER the trip, back at Birchdale still as spry as if he were 19 and not 91. Later, in September, his son Jim Prout brought Johh back to Birchdale to meet with the women paddlers who were there for a few days. Oh the tales! I especially treasured the ones about my mother and father. Eye-opening (and delightful) to be sure. John died on Feb. 3 this year. The following story titled “Boiling The Kittle” was written by Ray Koon, a sportsman from Massachusetts who used to go to Birchdale to fish for trout every spring. The story was written on Sept. 22, 1952; it is pure gold. Yesterday we “ran the river,” as they say down here—the Tusket River—one of Nova Scotia’s finest streams. During the morning, on the way down from Lake Bario, we were lucky enough to take a half dozen speckled square tails from the swirling pools here and there. 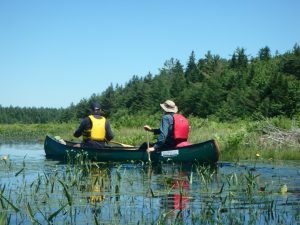 At noon, John Prout, our guide, swung the canoe out of the fast water into a quiet little cove rimmed with balsam fir and hackmatack. “Time to boil the kittle,” he announced as we slid up alongside a gravel beach. To stand on firm ground was a relief after several hours of teetering and balancing through the temperamental rips and eddies. While we hauled out the contents of the packsack, John hacked some splinters from a dead cedar, and with a handful of birch bark soon had a fire going. On this page in permanent black print, we want to record the fact that John Prout is the first and only guide of the many we have had through the years who builds a cooking fire fit enough to cook over. Most of those who masquerade under the title of “guide” spend half an hour chopping wood, stack up a pile big enough to barbecue an ox, then wait for it to die down in order to get within a pan-handle reach of it. But back to the kittle which is neither a kettle nor a pot, but a pail—a lard pail with a wire bail is the thing. A yard-long stick of green wood is thrust into the ground at just the right slant so the pail hangs over the fire; yet a little to one side, because there must be room enough for the trout pan. A rock under the base of the stick serves as a rest—and there you have it—the perfect rig for making tea. Tea? Always tea, in the Nova Scotia woods—and strong—strong enough to float a spoon. And what a lift it gives the weary. Have you ever eaten a meal under a fragrant balsam fir; ever inhaled the incense of cedar smoke blended with the savour of sizzling trout and the aroma of honest English tea? If not, you’ve missed out on life’s sweetest blessings. After lunch, as we lay back on a bed of velvety moss for a smoke, we asked John if he thought Heaven held any joys as rich as these. He picked up the kittle, scooped it full of water from the river and poured it on the embers of the fire. Then he answered: “Some day my guidin’ days will be over around here and I’ll put up my paddle for the last time. They say there’s River Jordan we got to cross. If I get over that all right and land in Heaven, and it’s not like this, I’ll just take off and start looking for another cove. Sandra this is a beautiful piece about John Prout. You’ve described him so well that in reading this I feel I know him too. What a very lovely man. He will be missed by all who knew him. Lovely story to read on this beautiful February day. Thanks for sharing it! Lovely to see you pop into view Sharon! Love this. It’s my sentiments exactly. Thank you for sharing, Sandra. Thanks, Sandra. Wonderful to travel in my mind back to Nova Scotia, and Birchdale/Nova Nada. And how wonderful to see you pop into view David! If you ever wander back to this part of the world, please get in touch!